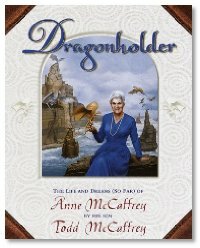 Interview: Michael, Summer and Michael talk Todd McCaffrey about many things, including following in the footsteps of his mom, who just happens to be a Grand Master of the genre, and how to play and how not to play in the universe she created, and the pressures that come with the expectations of the name "McCaffrey". He tells us about meeting genre greats as a youngster, and how he was pulled into writing in the world of Pern, and possible future collaborations in other worlds Anne has created over the years. The Library: Newer entries to the Library this week include Command Decision by Elizabeth Moon, Games of Command by Linnea Sinclair, All Together Dead by Charlaine Harris, The Man Who Melted by Jack Dann. However, I did see a couple of different copies of "Tomorrow's Children" for around $60, instead of the usual $200. Thanks for an excellent show that has put me onto some great books that aren't all that well advertised on this side of the Atlantic (I live in the UK). Thanks to you I have just read " A Secret Atlas" and "Cartomancy" over here in the UK. Both excellent, and I didn't see the reveal coming that ended "Cartomancy". It was a real "damn, now what happens" moment! Can't wait for the final part - so please, please Michael, hurry and get it finished (if you haven't already..."